This guide will help you be prepared to ace the most common private equity interview questions. The main types of PE interview questions you will encounter include technical knowledge, transaction experience, firm knowledge, and culture fit. In addition, you may also be asked to complete a practical financial modelingWhat is Financial ModelingFinancial modeling is performed in Excel to forecast a company's financial performance. Overview of what is financial modeling, how & why to build a model. A 3 statement model links income statement, balance sheet, and cash flow statement. More advanced types of financial models are built for valuation, plannnig, and related case study. In the sections below, we will go through the most common private equity interview questions and answers! What are the limitations of a DCF model? 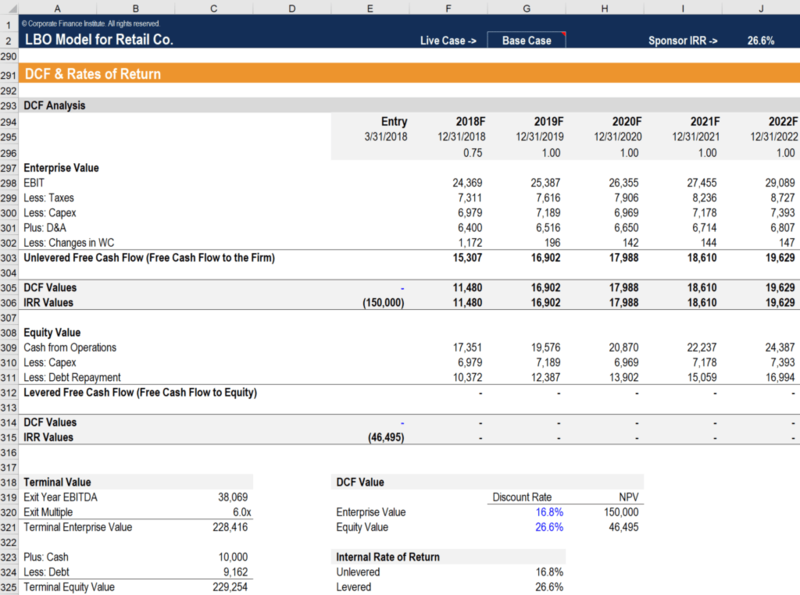 While discounted cash flowDiscounted Cash Flow DCF FormulaThe discounted cash flow DCF formula is the sum of the cash flow in each period divided by one plus the discount rate raised to the power of the period #. This article breaks down the DCF formula into simple terms with examples and a video of the calculation. The formula is used to determine the value of a business analysis is the best method available for assessing the intrinsic valueIntrinsic ValueThe intrinsic value of a business (or any investment security) is the present value of all expected future cash flows, discounted at the appropriate discount rate. Unlike relative forms of valuation that look at comparable companies, intrinsic valuation looks only at the inherent value of a business on its own. of a business, it has several limitations. One issue is that the terminal valueTerminal Value​The terminal value is used in valuing a company. The terminal value exists beyond the forecast period and assumes a going concern for the company. represents a disproportionately large amount of the value of the total business, and the assumptions used to calculate the terminal value (perpetual growthStable Growth vs. 2-Stage Valuation ModelIn valuation, we can find useful insights by comparing theories embedded in different valuation models at our disposal. In preparing a valuation model, however, an important insight becomes apparent. Learn the differences between stable growth and 2-stage valuation models. Download the template or exit multiple) are very sensitive. Another issue is that the discount rate used to calculate net present value is very sensitive to changes in assumptions about the betaBetaThe beta (β) of an investment security (i.e. a stock) is a measurement of its volatility of returns relative to the entire market. It is used as a measure of risk and is an integral part of the Capital Asset Pricing Model (CAPM). A company with a higher beta has greater risk and also greater expected returns., risk premium, etc. Finally, the entire forecast for the business is based on operating assumptions that are nearly impossible to precisely pin down. What are the most important factors in a merger model? From a valuation perspective, the most important factors in an M&A modelFinancial Modeling M&A are synergies, the form of consideration (cash vs shares), and purchase price. SynergiesTypes of SynergiesM&A synergies can occur from cost savings or revenue upside. There are various types of synergies in mergers and acquisition. This guide provides examples. A synergy is any effect that increases the value of a merged firm above the combined value of the two separate firms. Synergies may arise in M&A transactions enable the acquiring company to realize value by enhancing revenue or reducing operating costs, and this is typically the biggest driver of value in an M&A deal (note: synergy values are very hard to estimate and can often be overly optimistic). The mix of cash vs share consideration can have a major impact on accretion/dilutionAccretion DilutionAccretion Dilution Analysis is a simple test used to determine whether the proposed merger or acquisition will increase or decrease post-transaction EPS of per share metrics (such as EPS). To make a deal more accretive, the acquirer can add more cash to the mix and issue fewer shares. Finally, the purchase price and takeover premium are major factors in the value that’s created. What indicators would quickly tell you if an M&A deal is accretive or dilutive? The quickest way to tell if a deal between two public companies would be accretive is to compare their P/E multiplesPrice Earnings RatioThe Price Earnings Ratio (P/E Ratio) is the relationship between a company’s stock price and earnings per share. It gives investors a better sense of the value of a company. The P/E shows the expectations of the market and is the price you must pay per unit of current (or future) earnings. The company with a higher P/E multiple can acquire lesser valued companies on an accretive basis (assuming the takeover premium is not too high). Another important factor is the form of consideration and mix of cash vs share (see previous question). What assumptions is an LBO model most sensitive to? LBO models are most sensitive to the total leverageFinancial LeverageFinancial leverage refers to the amount of borrowed money used to purchase an asset with the expectation that the income from the new asset will exceed the cost of borrowing. In most cases, the provider of the debt will put a limit on how much risk it is ready to take and indicate a limit on the extent of the leverage the business can service (typically based on the debt/EBITDADebt/EBITDA RatioNet debt to earnings before interest, taxes, depreciation, and amortization (debt/EBITDA ratio) is a measure of financial leverage and a company’s ability to pay off its debt. Essentially, the net debt to EBITDA ratio gives an indication as to how long a company would need to operate at its current level to pay off ratio), the cost of debt, and the acquisition or exit multiple assumptions. In addition, operating assumptions for the business play a major role as well. Given two companies (A and B), how would you determine which one to invest it? Operating efficiency – analyzing ratios such as inventory turnoverInventory TurnoverInventory turnover, or the inventory turnover ratio, is the number of times a business sells and replaces its stock of goods during a given period. It considers the cost of goods sold, relative to its average inventory for a year or in any a set period of time., working capital management, etc. Management team – how good is the team at leading peopleLeadership TheoriesLeadership theories are schools of thought brought forward to explain how and why certain individuals become leaders. The theories emphasize the traits and behaviors that individuals can adopt to boost their own leadership abilities., managing the business, etc. All of the above criteria need be assessed in three ways: how they are in (1) the past, (2) the near-term future and (3) the long-term future. This will be the basis of a DCF model (which will have multiple operating scenariosScenario AnalysisScenario analysis is a technique used to analyze decisions through speculating various possible outcomes in financial investments. In financial modeling, this process is typically used to estimate changes in the value of a business or cash flow. By using the Choose or Offset functions an analyst can crease base case), and the risk-adjusted NPVNPV FormulaA guide to the NPV formula in Excel when performing financial analysis. It's important to understand exactly how the NPV formula works in Excel and the math behind it. NPV = F / [ (1 + r)^n ] where, PV = Present Value, F = Future payment (cash flow), r = Discount rate, n = the number of periods in the future for each business can be compared against the price the business might be purchased at. Describe a deal you worked on at Investment Bank X. Example answer: One of the most interesting and challenging deals I worked on at the bank was the sale of a private company to PE Firm Z for $275 million. Anything else that’s interesting you learned in the process about the seller, the buyer, the process, etc. All other questions related to the transaction will be some sort of derivative of the above question or dig deeper into the above transaction and expand in more detail on any of the points above. Image: CFI’s LBO Modeling Course. What do you know about us and why do you want to work at our firm? This is one of those private equity interview questions that you really have to prepare for. Giving generic answers like “your firm has a great reputation” is not sufficient – you need to point out some real specifics. Spend time going through the company’s website and looking at their current and past portfolio companies. Make sure you find several that you’re personally interested in and can speak about in detail (see the next question below). Have a solid understanding of the firm’s approach to investing, their track record, who the founders and management team are, and most important, what you like about their approach. See a list of the largest PE firmsTop 10 Private Equity FirmsWho are the top 10 private equity firms in the world? Our list of the top ten largest PE firms, sorted by total capital raised. Common strategies within P.E. include leveraged buyouts (LBO), venture capital, growth capital, distressed investments and mezzanine capital. to start doing some research. What do you think about some of our portfolio companies? What is our firm’s investment strategy? To answer this question well, you’ll have to do a lot of research. You can probably find an official statement on their website, but a more insightful answer would come from having read any interviews with founders and partners that talk about their approach, as well as understanding the themes across their portfolio companies and how they all fit together. These private equity interview questions are designed to see what you’re really like as a person, in order to determined how well you’d fit with the culture of the firm. Since PE firms are typically a lot smaller than sell-side firms, personality and culture fit matters a lot. The key to answering these questions well is to (A) understand what the questions are aiming at – assessing you personally in relation to the firm’s culture, and (B) being relaxed, organized with your thoughts, and showing that you’re a likable person who’s easy to get along with and who works well on a small team. Every firm and team has their own culture and types of personalities they like best, so it’s important to ask around and see what you can learn about them. General personality traits that nearly every firm values are hard working, reliable, respectful, humble, honest, easy to work with, inquisitive, organized, and possessing an extremely strong business sense. 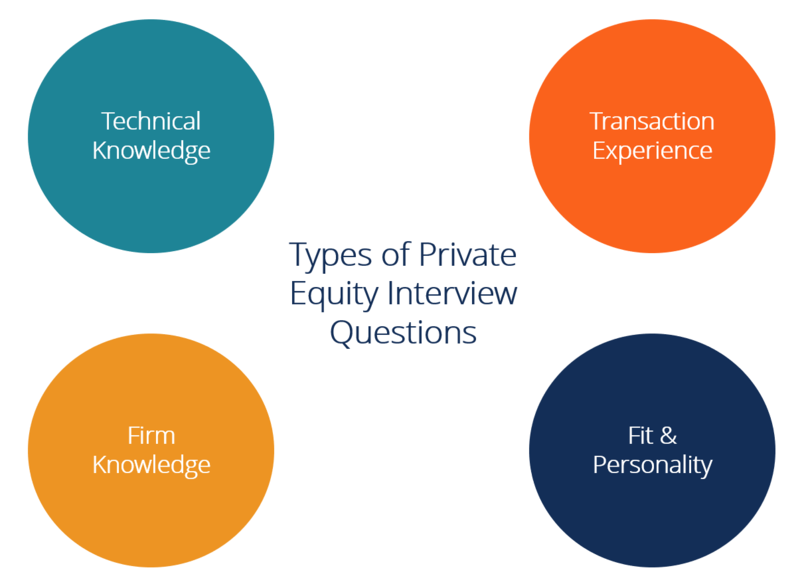 Learn more in CFI’s Why Private Equity GuideWhy Private EquityWhy Private Equity is a common private equity interview question you’ll encounter if you’re going through the interview process at a PE firm. It’s important to plan ahead so you’re not caught flat-footed and so that you have a compelling answer to the question..
Case studies are a great way for PE firms to quickly get a full picture of your financial modeling skillsFinancial Modeling SkillsLearn what the 10 most important financial modeling skills are and what's required to be good at financial modeling in Excel. he most important skills are 1 accounting, 2 Excel, 3 linking the financial statements, 4 forecasting, 5 problem-solving, 6 attention to detail, 7 simplicity, 8 esthetics, 9 presentations, 10 and valuation skills. It’s one thing to be able to talk about modeling, and another thing to actually have best practices when it comes to building models in Excel. The best way to prepare for case studies is by ensuring you have extremely strong financial modeling skills and brushing up with Financial Modeling Courses if necessary. In summary, there are four main types of private equity interview questions: technical, transactions, firm, and fit. Technical and transaction questions require you to have solid financial modeling and valuation experience, with a strong understanding of how to make good investments. Firm and fit questions are more soft skills type questions and require being prepared to speak in detail about the firm and about yourself. In addition to the above, you should expect a case study of some kind that requires analyzing a marketIndustry AnalysisIndustry analysis is a market assessment tool used by businesses and analysts to understand the complexity of an industry. There are three commonly used and and or business using financial modeling. Thank you for reading this guide to private equity interview questions. CFI is the official provider of the Financial Modeling & Valuation Analyst (FMVA)™FMVA™ CertificationThe Financial Modeling & Valueation Analyst (FMVA)™ accreditation is a global standard for financial analysts that covers finance, accounting, financial modeling, valuation, budgeting, forecasting, presentations, and strategy. certification program, designed to transform anyone into a world-class financial analyst.